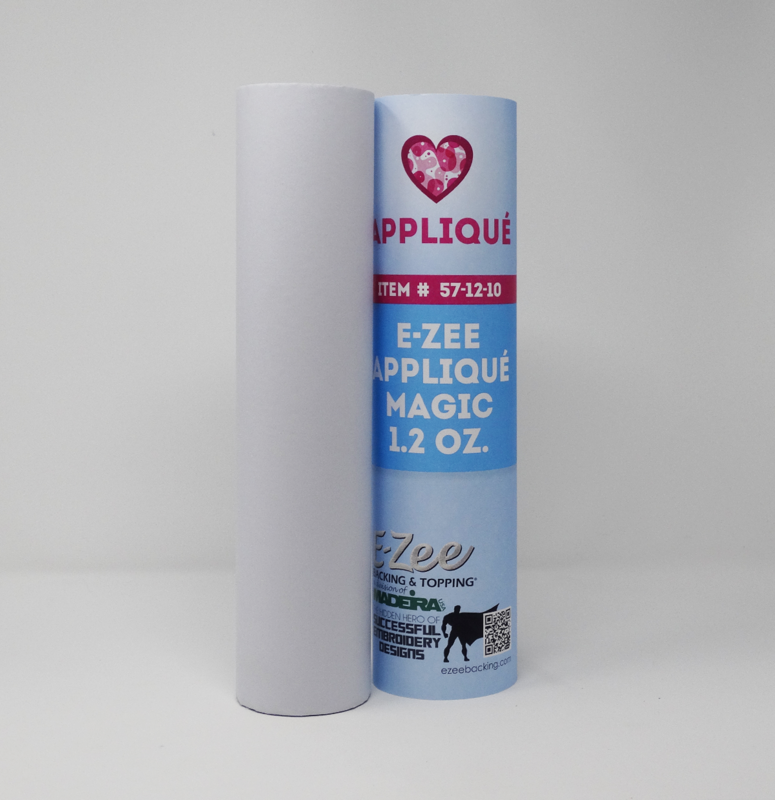 E-Zee Cut® Appliqué Magic 1.2 ounce is a double-sided adhesive backing used for appliqué embroidery that eliminates the need for heat seals, spray adhesives or glue. One side has a heat-activated adhesive that is lightly fused directly to the appliqué fabric with an iron or heat press. The other side has a release paper and pressure sensitive adhesive that is used to adhere the die cut fabric piece to the garment prior to embroidering . Start by identifying the two sides of E-Zee Cut® Appliqué Magic: The heat activated side has shiny dots visible when looking at different angles. The pressure sensitive side has a smooth, shiny release paper on it. Cut a piece from a roll of E-Zee Cut® Appliqué big enough for your appliqué template. Lay the fabric you will be using to appliqué down with the wrong side facing up. Lay the heat sensitive side of E-Zee Appliqué Magic down on top of the wrong side of the fabric. The release paper will be facing up. Fuse together by applying heat at 220° - 280° F for 10-12 seconds (Pressure = 5 bar, if using a heat press). Using your pattern template or pre-made die, trace and cut out the piece to be appliquéd. Remove the release paper and place the piece down in the designated, outlined area and apply pressure. Finish embroidering the appliqué design.